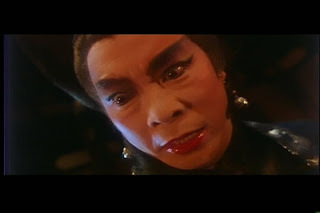 Fans of Hong Kong cinema often hail “A Chinese Ghost Story” (1987) as the pinnacle of horror movies. While I was initially skeptical, I can definitely see where they are coming from. 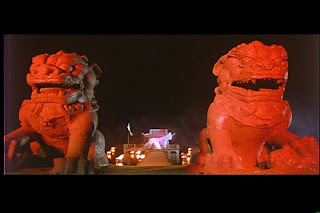 “A Chinese Ghost Story” is absolutely a product of the 1980’s, but in the best possible way: it blends goofball physical comedy, high-flying action, dazzling (by HK standards) special effects, a synth music soundtrack and a beautiful young starlet (Joey Wang). 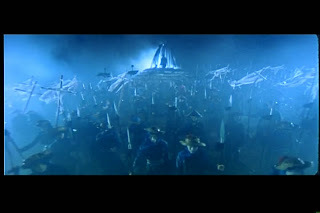 The film was directed by Siu-Tung Ching and produced by Tsui Hark. It spawned a wealth of sequels and knock-offs. The film opens on a bumbling, hard-up tax collector named Ling Choi Sin (Leslie Cheung) hiking laboriously towards a new town. His job makes him immediately unpopular and he ends up sleeping in a haunted temple on the outside of town. There he meets a Taoist swordfighter/monk, Yin Chek Hsia, who doesn’t quite fit in with the living or the dead. He’s a benevolent social outcast warring against the spirits of the temple and surrounding forest. 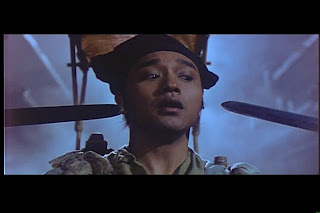 His competency and fighting prowess are in sharp contrast to Ling. 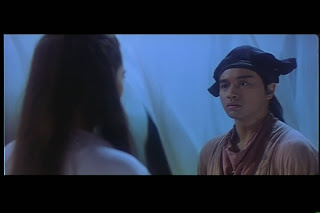 Soon Ling runs into Lit Sin Seen (Joey Wang), with whom he is immediately smitten. This ends up being a problem since she is a ghost who seduces travelers and then feeds them to her hermaphroditic tree-spirit master. However, even Lit is drawn in by Ling’s pathetic ineptitude and their romance blossoms. There isn’t much time for swooning, since the couple must then contend with Lit’s evil sisters, the tree-spirit’s enormous writhing tongues, Yin’s determined ghost-busting intrusions and an undead samurai army led by Lord Black (to whom Lit has been forcibly betrothed). The premise ends up being quite original and fun, with the supernatural elements being especially fresh for those unfamiliar with Chinese lore. 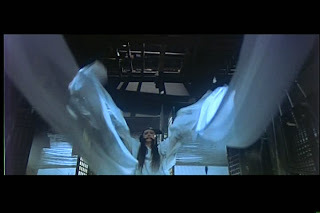 Though “A Chinese Ghost Story” came out amidst the “hopping vampire” craze in Hong Kong (Chinese vampires don’t drink blood and have to hop since rigor mortis prevents regular walking), the film relies neither on ghosts or vampires for it’s villains. The evil gender-ambiguous tree spirit provides a wickedly enjoyable new foe that horrifies and disgusts (in grand 80’s style) with its enormous slimy tentacle-tongues. 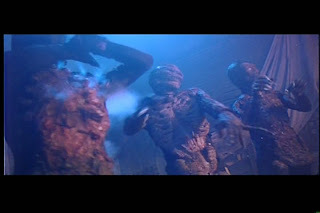 Initially the tree spirit’s attacks are filmed in “Evil Dead” style sped-up camera rushes terminating in humorous screaming close-ups on the victim (one even goes into the mouth and down the throat of the poor fellow). 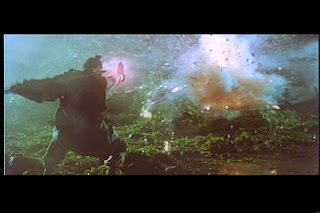 The majority of the effects in the first half of the film are springboard-assisted fight scenes where the combatants spend the vast majority of the time in the air. 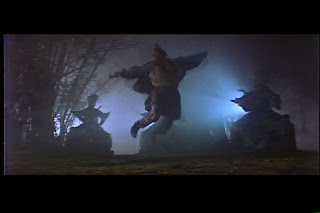 These quick-cut, confusing wuxia battles are the antithesis of the clarity and realism in HK action that I usually prefer, but they are redeemed by their sense of airborne agility and entertaining absurdity. The first half of the film also has an extended series of stop motion animations (!) featuring shriveled corpses that are trying to kill the hero as he stays in the temple ruins. Through a series of comedic mishaps and coincidences Ling remains blissfully unaware of the zombies and unknowingly foils their every move, eventually killing them with sunlight without ever noticing their presence. This combination of scares, tension, humor and irony (totally unrelated to the main story) gives a good sense of how the film operates. 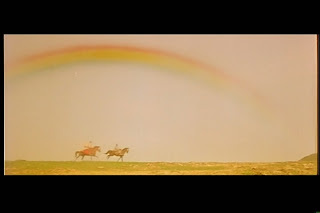 The director holds back on the revealing the full glory of his special effects until the second half of the film. Never fear, for we are soon to be given an exciting and memorable series of imaginative tricks. An enormous tongues seizing the protagonist! The monk draws a yin-yang in blood on his palm and uses it to fire explosives! 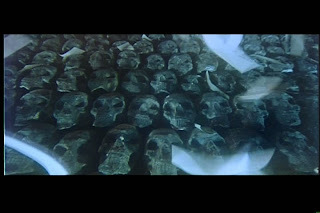 Lord Black opens his cape to reveal a body of disembodied heads that fly out shrieking and biting! Strangely, most of these semi-random events feel entirely natural within the context of the film. Siu-Tung Ching establishes a fast-pace, engrossing rhythm that energizes the film all the way through and allows even the most unpredictable events to occur without missing a beat. Even a narrative-halting music video with the dancing swordfighter/monk comes off as a logical extension of the 80’s-tastic excess. Excess is definitely the over-arching philosophy of the visual design. 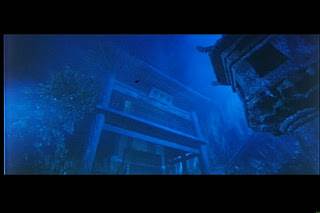 Day and night are cast in artificially over-emphasized orange and blue hues, with the scale tipped towards night-time and the fog machine set to “cumulus.” One of Siu-Tung Ching favorite tricks for adding additional interest to shots is to cant the camera at a 45 degree angle. 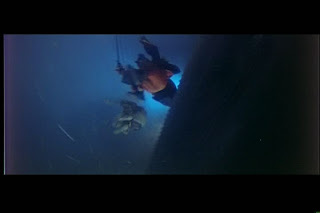 In some cases (I’m thinking of Tony Scott in “Domino” (2006)) this type of stylistic outpouring could drown the movie, but it fits the tone and serves to propel the plot and create the proper atmosphere and emotions. One thing that Siu-Tung Ching uses for setting an ephemeral, graceful mood is the constant presence silky drapes. I can understand why Lit wears them, since it gives her a ghostly, enrobed beauty and adds a tactile association to her allure. Where it starts to get out of hand is when they show up as backgrounds, weapons and even roads. The film is geared more towards action, effects and style than towards character development and stellar writing (it is a Hong Kong movie after all), but the ensemble deserves credit for giving the film an emotional core and lovable caricatures. Leslie Cheung, as Ling, is charmingly likable in the sort of Hugh Grant way where he wins us over even as we hate his films. Joey Wang earned hordes of adoring fans in an endearing role that has the requisite amount of sexiness and vulnerability to meet horror film standards and enough depth and range to create actual romantic chemistry. The swordfighter/monk, tree spirit, Lord Black and the rest of the cast fulfill their jobs with great vigor if not psychological insight or realistic dialogue. I especially enjoyed the local police, who obsessively and aggressively accost everyone with such unwarranted passion that it bordered on surrealism. Sounds like a really fun version of what Onmyoji should've been. Only reason I ever knew that hopping thing about Chinese ghosts is Hsien-Ko, a character in the fighting game Darkstalkers, can only hop. And all the tilted camera angles always remind me of the 1960s Batman series. But what is it with horror and evil trees? Evil Dead, Alone in the Dark, A Chinese Ghost Story. 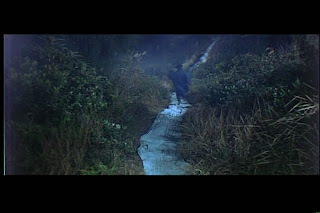 According to Tsui Hark most of the visual elements were heavily inspired by The Evil Dead and Raimi's camerawork. 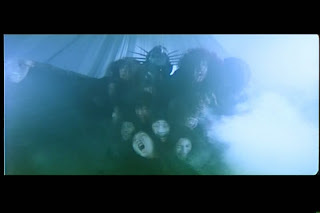 In turn, Raimi later "borrowed" a lot from Hark's Once upon a time in China series for Xena and Hercules. 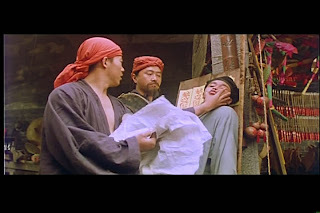 Apparently, Raimi's popularity in Hongkong was also the reason for John Woo to do Hard Target with van Damme, where Raimi served as executive producer.